What makes people and communities connect, share stories and skills, and become stronger together? That’s a question we’ve been pondering quite a lot lately as we build a circle of support for communities in order to promote social action across Stockport, and spark the conditions for it to thrive. We’re not alone asking that question. The congregation at Heaton Moor United Church have been asking for some time what the magic ingredients are to build bridges and make connections across the Heaton communities. The photograph above shows an event they held with their friends at South Manchester Muslim Association. 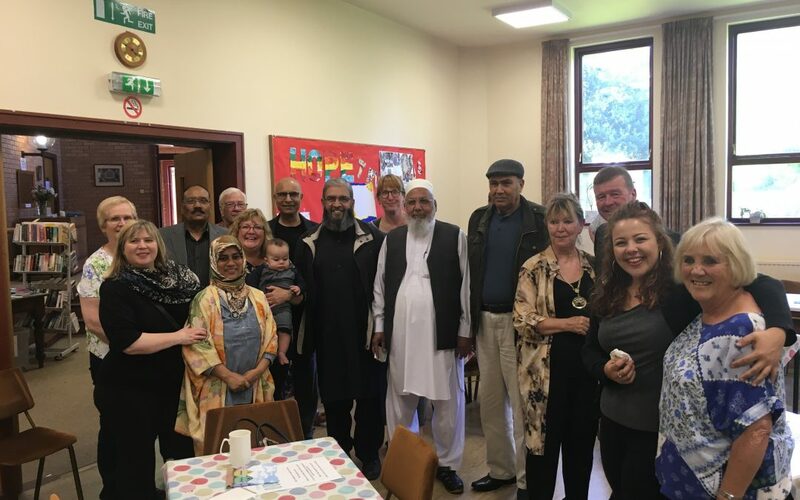 This hugely successful event started a chain connection that continues to bring together people of faith and no faith, with the aim of getting to know each other better. They found that giving people the resources, space and time to engage in social activities is one way of connecting communities and that’s also a vital element of our circle of support. But first people need to know about each other, what’s going on and where to go to make those connections. Which is where our new digital tools come in. Early in our project we released the first version of our Community Groups Directory on the Council website, offering staff and partners, as well as residents, a single place to source reliable up-to-date information on community groups and services. Over the last six months we’ve been regularly updating this resource using an Agile approach to design and delivery, with new releases coming out every few weeks. We’ve also been carrying out regular testing in the community to understand how we can keep improving it. To help us with this, we set up a multi-agency group of community capacity workers, project managers and digital officers from the Council, housing associations and voluntary organisations. The group ran a workshop over the summer to agree a new name for the directory, Stockport Local, and some messages about how it can connect people and communities, which we will promoting in various communications over the next few months. As a result we have placed a number of adverts and editorial pieces appearing in community and family magazines and will be encouraging local media to take up the story. 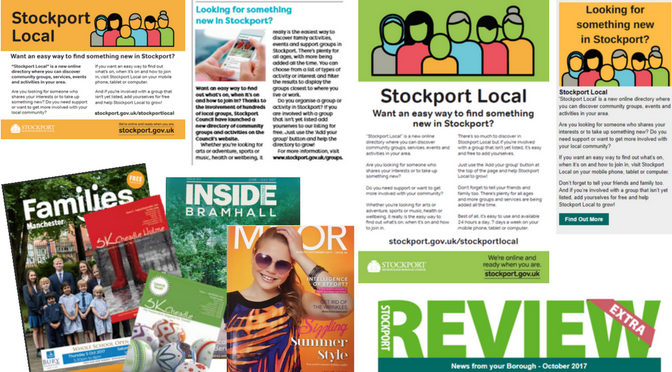 We will be promoting Stockport Local via social media and our own digital bulletins, such as the Stockport Review Extra, which is sent out to 8,000 residents. We are also preparing supporting materials for staff and partners to help them spread the word. Following feedback directly from users and through the engagement group, we have added a number of new features to the groups information page, including adding directions to reach the group, page printing and download options, links to Facebook or Twitter accounts and details of any events organised by the group, with reciprocal links from our events calendar. We have also introduced a management console for group owners, so they can keep their own page up-to-date, including entering and managing any events they run, for automatic inclusion in the Events calendar. Our primary focus over the next few months is to spread the word about Stockport Local, to encourage more groups and services to add themselves and to demonstrate to staff and residents how to make the most of this fantastic resource. Heaton Moor United Church’s initiative continues to bring together people and that’s the vision at the heart of Stockport Local, and one we’re going to keep working towards for all of Stockport’s communities. We’ll be posting again with more about the latest features and benefits we’re working on very soon!